If you follow me at all on social media, you know my three Ts: teaching, Target, and task cards. I am going to assume if you are reading this that you are already familiar with the first two because you are probably a teacher and, I mean, who doesn't love Target? But task cards? What are those? Task cards are hands-down my favorite teaching tool. Essentially, they are small cards with a task for students to complete on each of them. It might be a verb to conjugate, an open-ended question to answer, finding an error in a sentence and rewriting the sentence correctly, or something else. Task cards can be over any topic you choose. It could be a grammar point like telling time in Spanish, verb tense like the preterite, verb group like reflexive verbs, or vocabulary like body parts. Whatever you want your students to review! They can be used for a variety of activities, the right ones provide a well-rounded review of a topic, they promote collaboration and conversation, and students say they really help their understanding! I have always thought a good engaging lesson plan was the best classroom management tool a teacher could have and task cards make a great addition to any lesson plan! 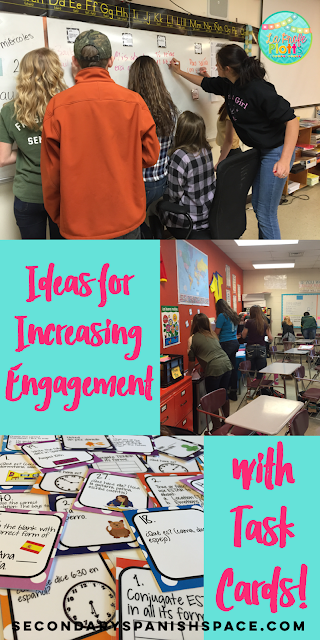 Today I am sharing some of my favorite ways to use them in class. Whether you are a task card addict like me or new to the concept, I hope you leave here with some ideas! Probably the most popular (and easiest!) 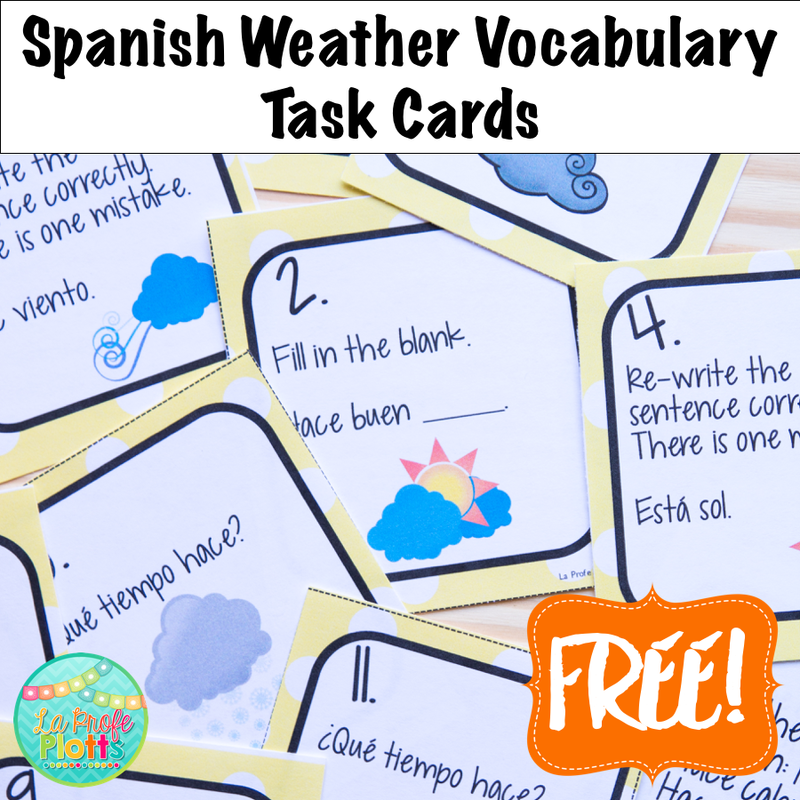 way to use task cards, this activity can be done with very little prep. 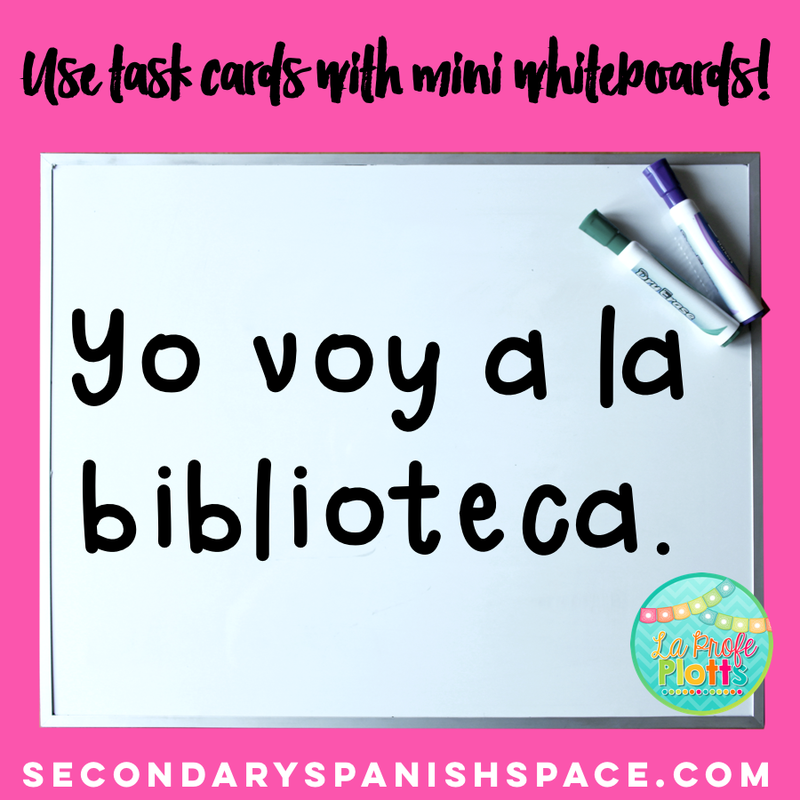 Simply print and cut the task cards and hang them around the room. Give students a sheet to record their answers or, if you don't have time to make copies, ask them to take out a piece of paper and number it 1 - whatever # of task cards you are using. Once they are ready, have them walk around and complete the tasks on the cards by writing the answers on their response sheet. It's up to you whether they work individually or in pairs. I let them choose and it is usually a good mix of students working individually and with a partner. I LOVE seeing them collaborate and work together! You have to establish a culture in your room where it is expected that they are an equal partner in the activity, not just following someone around and writing down their answers. That doesn't help them learn! I always have music playing while they do task cards to help create a fun, upbeat vibe. Click HERE for a post I wrote about Pandora stations I like using in class! All of my sets have 48 cards and I like to hang all 48 up but tell students they can pick any 30 to complete. That way, they have some choice in the activity and can skip ones they don't want to, or are unable to do. I always encourage them to challenge themselves and they are usually good about doing a mix of cards. I like to meander and check in with kids while they are doing the cards to see if they came across one they couldn't do and help them figure it out. Once everyone is done, I display the answer key with my projector and have students quickly check their answers. I have them count up the number they got correct and write that number at the top of their paper. A quick show of hands ("Everyone who got 25 or more correct, raise your hand. Everyone who got 20 or more correct, raise your hand.") before they turn their paper in tells me where we are with the material and allows me to adjust my lesson plans accordingly. 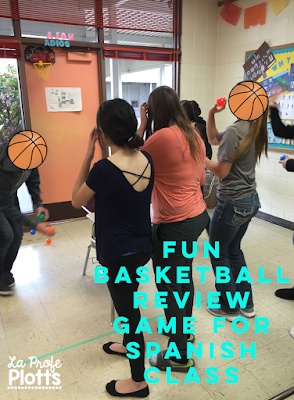 Such a simple and fun formative assessment that gets students out of their seats! *Use them for differentiation. Make individual response sheets for each student by highlighting the numbers you want that student to answer. Students only answer the ones highlighted on their sheet. That way, you can pick and choose the level of difficulty of the activity for each student. *Sunny? Tape them up outside and let students get some fresh air while they work! They will be so happy to be outside that they'll forget they are learning AND you will be the coolest teacher ever for letting them go outside. Win-win! PRO TIP: Laminate your task cards so when you hang them up with tape, you can remove the tape easily without tearing the paper when you are done with the activity. You can use them over and over! A more controlled version of Walk and Write, Scoot is played by placing one task card on each desk. You'll want to choose cards that EVERY student can complete in about the same amount of time. By that I mean don't do fill in the blanks and ones where students have to write two complete sentences. You'll have fill in the blank kids twiddling their thumbs if you do. Once ready to play, give students a response sheet and have them sit in a random desk. Tell them they will end up answering all of the cards so it doesn't matter where they start! Students have a designated amount of time to answer the card on their desk. How much time depends on what you are asking them to do. Once the time is up, students move in an orderly fashion to the next desk. Make sure to go over the pattern of movement with them before they start. I have even been known to make arrows on the floor with my beloved colorful masking tape the first time or two we play so students can easily see which direction to move and there is no confusion. I'm all about the quick transitions and not wasting class time so I like to use music to pace the game and keep it moving. Students start with a quiet classroom. When it is time to move, play music. Students need to be in the next seat when the music stops. This shouldn't take more than a couple seconds. Repeat until kids make it back to their original seats! I do the same thing with the answer key, self-checking, and show of hands as I do with Walk and Write. 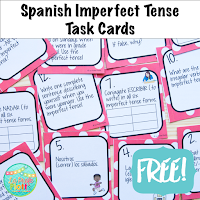 Another fun formative assessment alternative to a worksheet! a. You will need to clear the area around your whiteboard. You will want to place a piece of masking tape on the floor about 10 feet from the whiteboard, parallel to the whiteboard. That is the line teams will stand behind so you'll need space for students beyond that line, too. c. Divide students into teams. I like to do something like have them quickly line up by height, by birthday, etc. and then divvy them up into teams that way. Have them line up in a single file line behind the line on the floor in front of the cards, one team per section. Give the first person in each line a whiteboard marker. d. Instructions time! 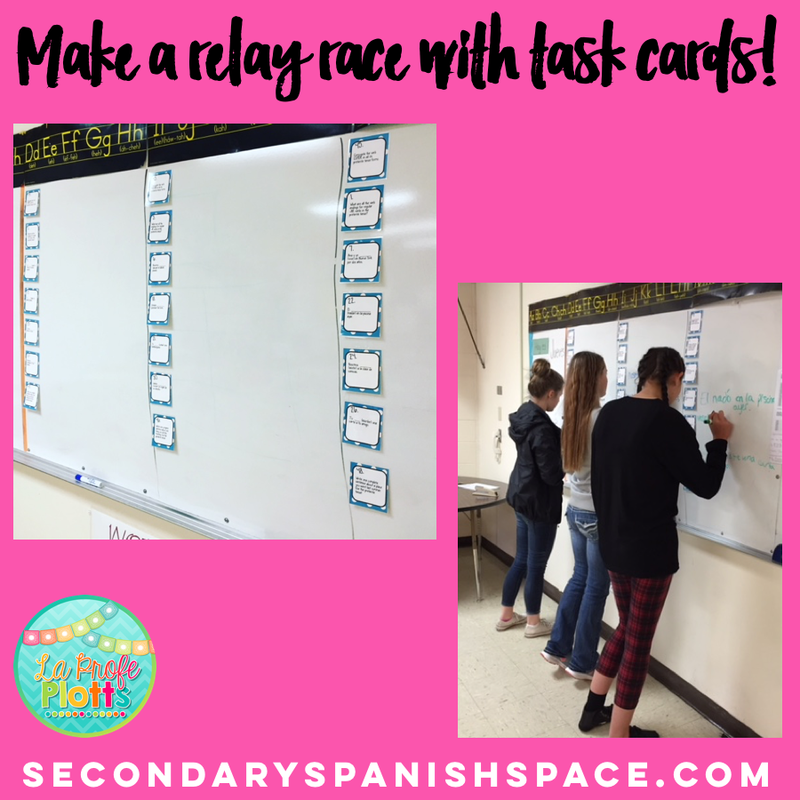 Tell students that they are going to be working as a team to complete all their task cards. When they are at the front of the line, it is their turn. During their turn, they can go up to the board and do one of two things: 1. Do any task card that has not been done yet. OR 2. Make ONE correction to an answer already on the board. If the card is fill in the blank, they need to write out the whole sentence, not just the missing word. That makes it easier for you to correct and is good practice, too! Students have to do something each turn. No fair just walking up to the board and turning around! It could be as small as adding an accent to a word already on the board, but they have to do something. It's important that you stress the two options with students and they understand. Otherwise, you will have your stronger students going up there and making all the corrections needed in one swoop. No fun and doesn't help everyone review. One more rule: when students are at the whiteboard, they cannot get help from people in line. They are on their own. Teams are welcome to discuss what is on the board when they are waiting in line and try to figure out where the errors are, but they may not shout out answers to the person at the board. e. As the teacher, your main job during the game is to keep an eye on the whiteboard so as soon as a team gets all the cards correct, you can put a big star on their section and they know to stop. Otherwise, they'll keep making corrections to things that don't need corrected. Even if they are not the first team to finish, teams need to continue going until they get their star. 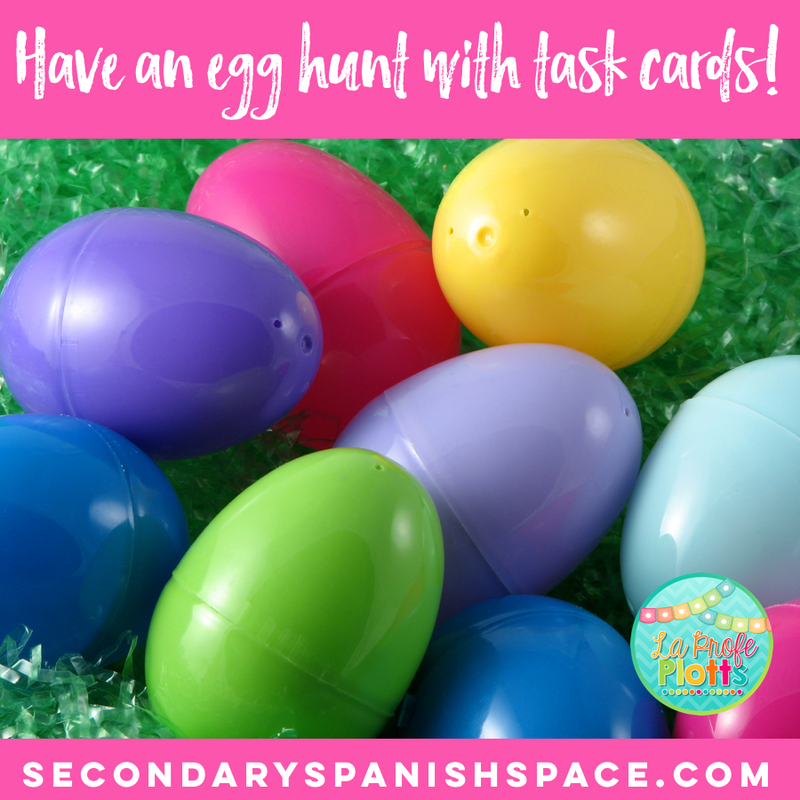 I love stuffing plastic eggs with task cards and sending my students on an Easter egg hunt! They work in teams to find their team's color of eggs and then complete the task cards hidden inside the eggs. First team done wins! 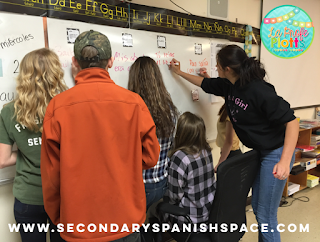 Click HERE for a blog post I wrote last spring for Secondary Spanish Space with detailed instructions on how you can do one, too! Each student needs a mini whiteboard, marker, and eraser. Ask students questions from the task cards or place them under a document camera. Have students write answers on their mini whiteboard and hold up. Walk around and give them a thumbs up if correct or a discreet head shake if incorrect. Students need to correct their answer until they get a thumbs up. Encourage students to try and answer on their own, without looking at the other whiteboards. Good, quick formative assessment and students LOVE writing on mini whiteboards! *Extension- Do this activity in small groups and designate a student to lead each group and ask the questions and check answers. You'll need to teach expectations for the leaders about being kind with their feedback, not condescending. I love seeing how excited the leaders get to be "the teacher"! 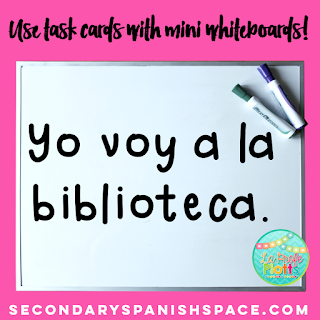 Task cards can make a quick and easy exit ticket. Give each student a sticky note. Put a card under a document camera and ask students to write the answer on their sticky note. No need for names. Have students hand you their sticky note on the way out the door. It is a good way to assess their understanding so you can adjust the next day's lesson plans if need be! a. Before students come to class, you have some prep work to do. I promise it is worth it! You need three piles of 8-10 task cards, one pile for each team. Like with the relay race game, you want to make them as even as possible. 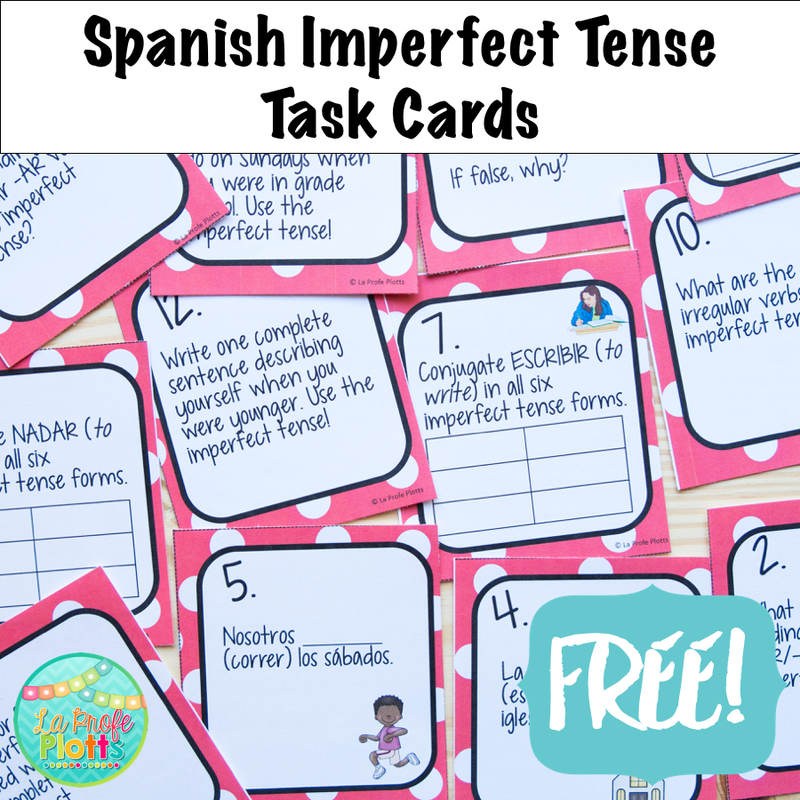 If using Preterite vs. Imperfect task cards, don't give one team only preterite cards and another team only imperfect cards. Mix it up so they get a well-rounded review! Once you have your task cards ready, you will need to make room for the two playing areas (see yellow diagram below). You'll need a kid's basketball hoop, the kind that hangs on the back of a door, a basket or box with small plastic ball pit balls (50 for $7.99 + free shipping! ), a line on the floor for the shooting team to stand behind (I use masking tape), whiteboard, and dry erase markers. 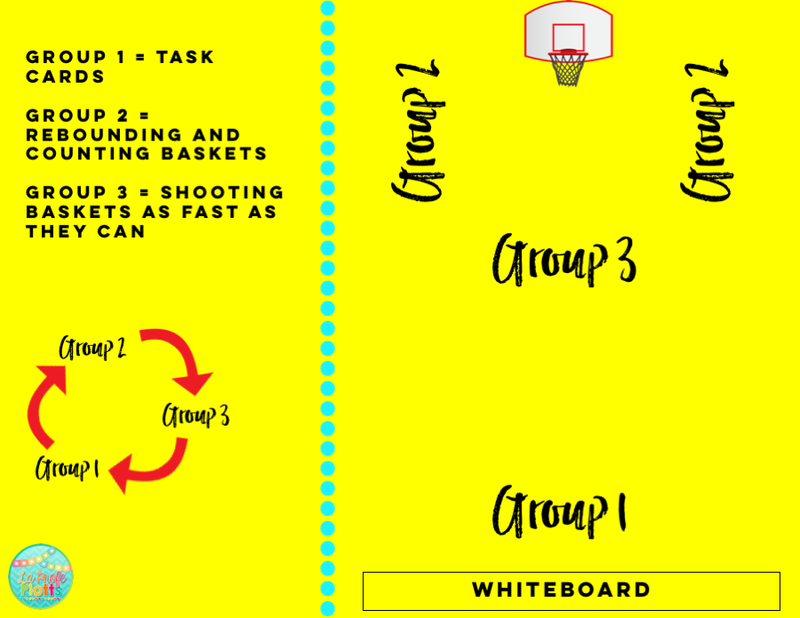 Hang the hoop and put the balls on a desk right in front of the line on the floor so they are easy for students to grab. Task cards need to get hung up on the whiteboard like in the picture below, spread out so multiple students can be working at a time. Make sure you have lots of markers available so all members of a team can be working at the same time. b. When you are ready to play the game, divide students into three even teams. Give them 15 seconds to come up with a team name. (If they can't come up with one quickly, I give them a name and it's always something awesome like Justin Bieber Fan Club. They've learned to quickly pick names.) Write the names in a small spot on the board. Give yourself room to write points underneath or next to each team. Send each group to their designated spot. Explain what each group will be doing. Group 1: Working as a team to complete all the task cards on the whiteboard as fast as they can. The faster they go, the less time Group 3 will have to shoot and earn points. They need to write the answers underneath each card. If a task is fill in the blank, they need to write out the whole sentence (1. It's good practice and 2. It's easier for you to check that way.). Tell them you will be checking answers as they work and you'll put a star next to each answer when it is correct. They need to keep working until all cards have a star. No star means something is wrong with the answer and they need to fix it! Group 2: Rebounding and counting baskets. This group needs to designate two people to keep track of how many baskets are made (two just to be sure the number is correct). Everyone else is rebounding balls and either handing them to people shooting or placing them in the basket. It will be fast and furious. They need to hustle! Group 3 should never be waiting for balls. If you have a TA, it's a good idea to have them hang out over in this area and keep an eye on it while you are busy checking answers at the whiteboard. Group 3: Shooting balls into the basket as fast as they can! They earn one point for each made basket. We always play two rounds and the teams with the highest combined total from their two rounds wins! Toes need to stay behind the line and no leaning over, either! 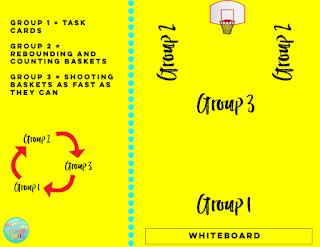 c. During play, you will be busy keeping one eye on the whiteboard so you can check answers off as soon as they are correct and one eye on the groups by the hoop. As Group 1 gets answers correct, put a star above the correct answers so students know to move on to a different card. As soon as all answers are starred, yell ¡Paran! Group 3 needs to stop shooting and Group 2 needs to report the numbers of baskets made to you. Write the number next to or under Group 3's team name. Once done, have students help you take down the task cards and erase the answers. Hang up the new pile. d. Have teams rotate one position (see diagram below). Repeat until all teams go through each station twice. My original plan for this game was for one round. That quickly went out the window when students BEGGED me to go another round. They were totally strategizing how to do better the second time around which melted my teacher heart so I relented and a game with two rounds it became. You will have to use a different set of cards for Round 2. Group 1 can use Group 2's cards, Group 2 can use Group 3's, etc. e. Team with the most points at the end of two rounds wins! 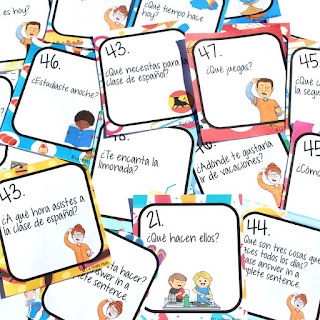 @schoolencasa has students use various sets at review time to quiz each other in partners. @spanish.profe splits her large classes into two groups: one group walks and does the task cards that are posted around the room while the other group does a seat or partner assignment, then they switch. @brainnijastpt says "We mix them up and hide them all over the classroom. We often have several different sets hanging all over the place at the same time, so students have to find the ones they are working on. We post different levels, different topics, and different tasks. And by placing them all over the room everyone is up and moving so the engagement is through the roof. Our best hiding place so far was on the ceiling and they had to use binoculars to read it." @ekbubb says "I like to scaffold them and have kids do 15 each day. I can grade them quickly and give feedback on 15. At the end of the week, the kids have done 45 cards!" @maestra_in_middle says "I love to use them to get kids up and walking. They also tend to make it a competition to get the most correct the fastest. I also love to print off multiple sets and have the kids do it as a review with a substitute teacher in pairs and table groups if I'm unexpectedly going to be out. Takes the whole class time and is one of the few worthy assignments I can leave with a substitute without feeling teacher guilt I left them with something that's just busy work." 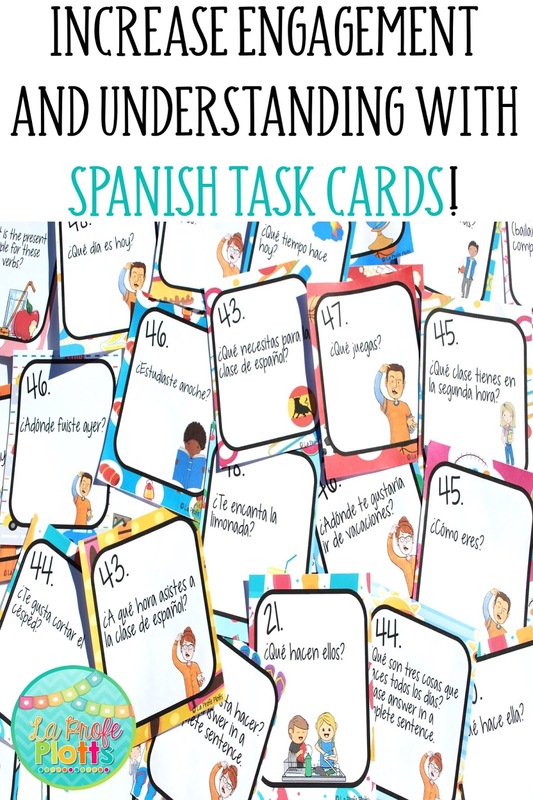 @theengagedspanishclassroom says "I hang them around the room and have students visit them like quick stations! It gets them moving and they still answer all of them! I also hang them *way* out of order so they have to pay attention!" 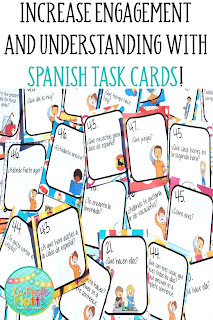 Want to try task cards in your Spanish classes for free? 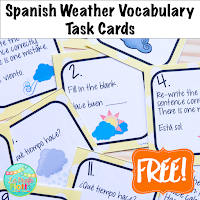 Click HERE for a free imperfect tense sample set and HERE for a free Spanish weather vocabulary task card sample set! 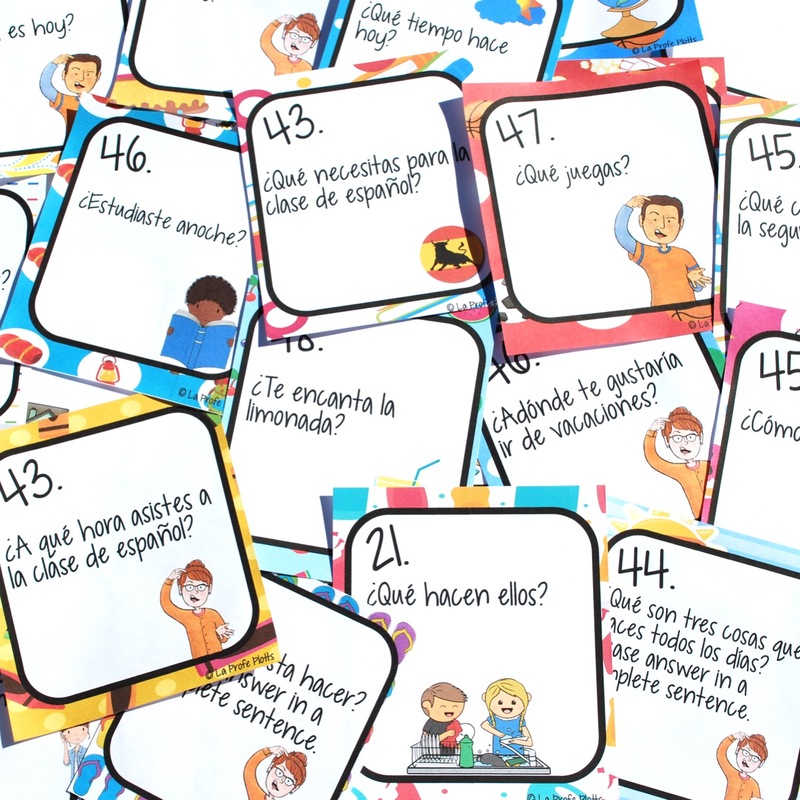 Each sample set includes 12 cards, student response sheet, and answer key! Thanks, Jessica! I am so glad you got some new ideas! I do love these! I use them often and some students make it a game and a race to see who gets done 1st,but also correct Lol! And I kinda hide some for upper levels. They also pair up and work in teams for groups! Yay for another task card fan! You sound like me- using them in all kinds of different ways!